You know, many times I have always believed that a good sign of healing was the good that came out of the hard – and although that is true, there is another side to healing I never really embraced before, and that is “pain”. My therapist sent me an email last night and said to me “you being in this stuck place; you feeling this pain IS the healing“. He said “this big big place you are in where you feel the most stuck and hurt inside, IS the movement“. He also assured me that he hears how hard this stuck place feels as well. He also assured me “help is on the way, I am with you in this, by your side, we will help you through this“. and that felt very comforting and very supportive, although it didn’t feel good to know a place of hard is healing. 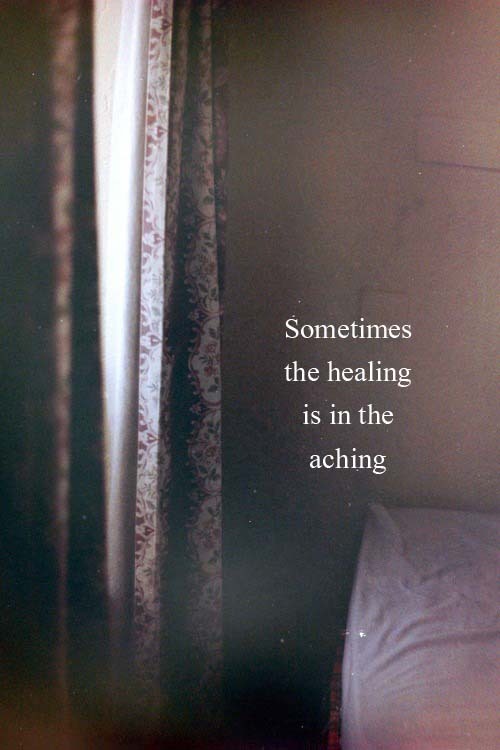 I saw a quote today (the photo on the left) “sometimes the healing is in the aching” sounds condescending doesn’t it? We are always so quick to want to get to the other side of hard – the “joy” “peace” “feeling of content” “happy” “excited” “accepting“. those are the emotions of healing on the other side of hard that we look for … but what I have come to realize more so in the past 24 hours is that, healing is also happening in the hard feelings; the stuck feelings; the feeling of hopelessness at times. I am healing right now – in the stuck, in the hard – in this very moment! I have written about this before on how some of my best work in done in the hard, but never did I really truly realize that while in the hard, while I am feeling hopeless at times in the stuck – healing is actually taking place. Everyday I am taking small steps out of this stuck feeling I have been in for 2 months now, and I have been fighting so hard to get to the other side of stuck, I didn’t stop to think that in the stuck healing is taking place, that maybe this is the place I “have” to be in order to move “through it”. I am no longer going to beat myself up over this hard place I am in. I am going to accept it and keep working with it. I am going to take steps forward in my healing – in therapy with my therapist and trust the path he is helping me work through. I am always saying “I want to feel better now” .. I know a lot of people who suffer from feeling stuck and want to feel better now, maybe now is not the plan of healing … maybe feeling better now doesn’t teach me what I need to learn while in the hard? At first I didn’t understand what my therapist meant in his email – that he was “excited” that I was talking to him about the stuck place I am in, that “this” is the movement .. and then it made sense. We have big work in therapy this week and maybe if I walk into it just saying “ok I am stuck and I don’t just have to look for the outcome, rather just accept this stuck place as hard and it’s healing” maybe it will shift something for me – that is my hope. Maybe this very blog post is another step forward – in fact I know it is. I will get up and go to session in the morning .. I will show up and just be and not put expectations on myself except to just “accept” where I am “accept” the support “trust” the process that my therapist is walking with me, and know that I am supported in this .. that is the what I can do. I am healing right now, in this very moment – in the stuck and in the hard. Previous poststill holding on . . .
“Feeling the Pain is the Healing”….I believe this but it’s so hard to keep it in mind. Every fiber in my being behaves as if pain is to be avoided, averted, figured out, fought, run from, analyzed, work on, numbed, and probably dozens of other things. All of them are the opposite of accepting pain as part of the healing process. And this: “(if), I accept that work can be done (while) being stuck in the hard”. Ah! this is really good. I usually interpret pain as evidence that something is WRONG, I’ve made a mistake. thanks for writing this. I’m inspired to write more on this topic too. PS. I’m now getting email notices of your blog posts same day. TAh. YAY I got your email and I would LOVE LOVE LOVE to have you guest blog :) yay! Hi Karen, Im new here (Gel’s post led me here) and I just wanted/had to drop a little line here. I frickin’ love this post. The healing is in feeling the pain… The healing is in acknowledging the pain! Giving it a name, giving it the attention it yearns for, and giving it its place in your system. Healing is in feeling in general, not just pain. But learning to acknowledge all those different shades of emotions and learning to give them their ‘place’ in our being. I love this post too. I really appreciate the encouragement right now. Thank you. Good and healing thoughts to you as you go through this territory. After reading your post I wondered why we have never crossed paths before. Guess I just haven’t been able to do as much blog exploring as I used to.